If you've ever wondered what my 'style' is, I really think this photo sums it up nicely. This is so me :-) I'm not pushing or promoting any kind of fabric, this is just me - all me, pulling from my stash. Like everyone, my quilting style and taste has changed and evolved over the years. I've never been one to really work from one collection, I always like to mix it up. Its quite an eclectic mix, always with a vintage/antique feel. I love a floral too, can you tell? ;-) My new favourite are shirting fabrics, I know they're often featured in Civil War collections, I love those neutral cream tones with tiny ditsy prints. They're so versatile. I'm so changeable though, I'll no doubt work on something totally different next week! Here I've started work on an apple core project, which will be a new cushion to live on my sofa. I haven't got a plan of sorts, I'm just making it up as I go along (same old). Its almost the size I need, so once I get to that point I'll think about how I'll finish it. 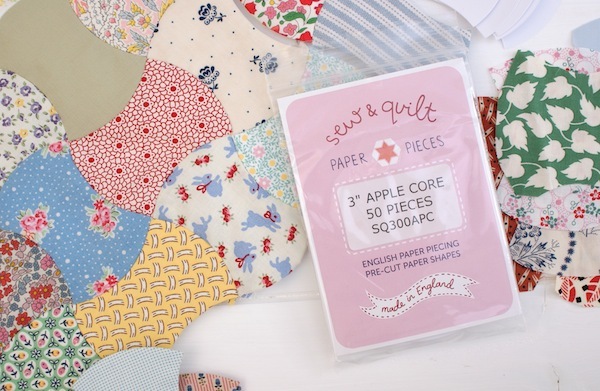 I'm using the 3" apple core english paper piecing shapes from my shop. I'm glue-basting with these, I find it works so well with curved shapes. I'll post a few in action photo's on here so you get the gist of it, if you've not tried with this particular shape. For help with EPP you can view my blog series here, which includes a curved shape tutorial using clamshells as well. 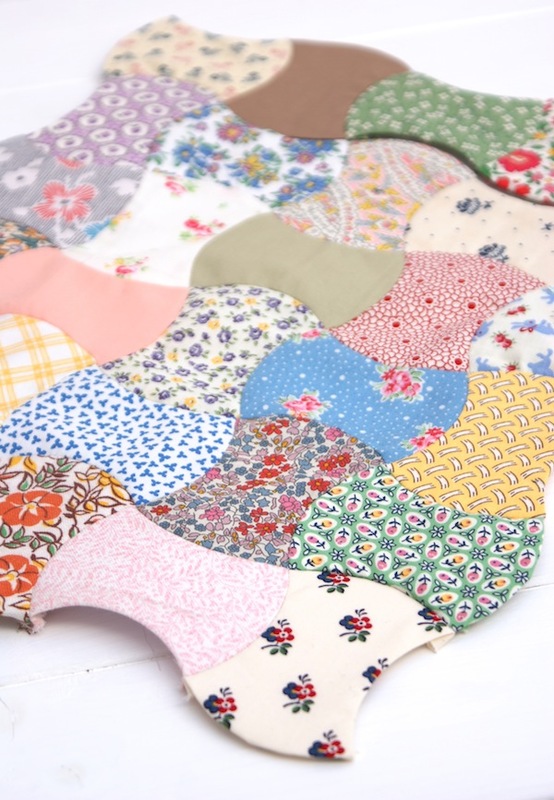 On a side note my Sew and Quilt EPP shapes are now sold in Europe (and soon Dubai!) as well as the UK! I've recently started to offer wholesale to other shops so it's been a busy few weeks. Exciting! So do ask your favourite quilt shops for them ;-) Or drop me an email if you have a shop, I'd be happy to hear from you. Have you tried apple core shapes? I'll keep you posted on how this turns out. Have a great week friends! Love the look of this! 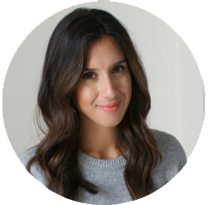 You have a wonderful blog Jessie, so many beautiful and happy projects! Love those applecores! I`ve never play with apple core! Oh so pretty, love the fabrics. Meant to add, years ago, and I mean about 15 years, I cut out apple cores, then put them away, now with EPP, think I may have to reconsider and cut some more and obtain some EPP Apple Core Papers, only trouble is I am in Australia, guess they will be available here or online eventually. I have done apple piecing but not with EPP. Yours is beautiful and would think that it is much easier with such small cores. Like your color choices! Such a pretty collection of fabrics!